Its time to say goodbye to TheTop10Reasons.com. That website was one of my first ventures into blogging. It’s funny to look back at it and remind myself why I choose the name TheTop10Reasons.com. When I was getting started with trying to figure out how to make money online I kept reading how “experts” said to write content in lists like “5 Ways To Make Money Online” or “Top 10 Community Colleges In The Northeast” or “5 Reasons To Buy American”. You get it. I had just been let go by Quicken Loans so I had a lot of mortgage related info rattling around in my head. Figured it would give me a format to adhere to when I wrote “The Top 10 Reasons To…”. This was also when I learned about Google Adsense. Doing research I read that most mortgage related keywords like “30 year mortgage” were being bid on by advertisers like Quicken Loans in the range of $18 per click. If somebody clicked on one of those ads on my site I would earn about $3. It definitely got me curious. I was familiar with the Lending Tree Affiliate Program as I learned about it when calling Lending Tree leads when I was a mortgage banker at Quicken Loans. This was one of the leading reasons why I started learning about affiliate marketing. When I learned Quicken Loans was spending $10 to $70 to buy leads from Lending Tree to give to me to call on for up to 12 hours and learned I could earn $10 – $50 finding leads for the Lending Tree Affiliate Program I knew I had to figure this out. Why work the phones for 12 hours a day to try and make 1 sale where I would earn about $250 when I could create a system sending 10 leads a day to Lending Tree and make up to $500 a day. Quicken Loans has an affiliate program which they denied my application for but Lending Tree let me in. If I remember correctly I averaged 4 leads a week through banners or ads on TheTop10Reasons.com. $40 to $200 a week. Not bad. I was also earning $5 a day from people clicking on Google Ads. Not bad again. Lets call it $225 a week. This gave me the confidence to keep writing. It didn’t happen overnight. Those earnings didn’t show up till month 6 as TheTop10Reasons.com was working its way up the rankings in Google. Much like most people who start a blog the thing that excited me most in the beginning was the traffic. You need traffic to make money online. The first day I had 100 visitors I was ecstatic. It gave me that push to keep going. Like most “niche blogs” though there is a time when you start to run out of content. I knew a lot about mortgages since I worked as a mortgage banker for 2.5 years but how much more could I continue to come up with? My format – The Top 10 Reasons why… – was also starting to feel forced. I also noticed I did a poor job of listing my reasons least to most important. I was just writing 10 reasons and hopefully one of them resonated with the reader. The content was good but the flow was not. After writing everything I could about mortgages I started to write about politics and other ramblings. TheTop10Reasons.com was morphing into something more of a personal blog than a format based blog. Somewhere in the middle of all of it I thought it would be great to turn the site into more of an article site like EzineArticles.com but with a The Top 10 Reasons twist. It never took. The whole article directory rush was on the down slope and rightfully so. So TheTop10Reasons.com went to the wayside and I wrote my last article on December 14, 2011. Its floundered around since then. I’d check on it every once in awhile. Change a theme. Clear out spam comments. Slide in new ads. Stuff like that. The site did get some decent traffic but I’m pretty sure it was hit with the Google Penguin update in 2012. Traffic dropped, has continued to drop, and rightfully so. Here are its stats, top 35 keywords, and top 25 posts. My 3rd month of blogging was my best month. I’m pretty sure its because of my posts about Barack Obama and John McCain leading up to the 2008 Presidential Election. 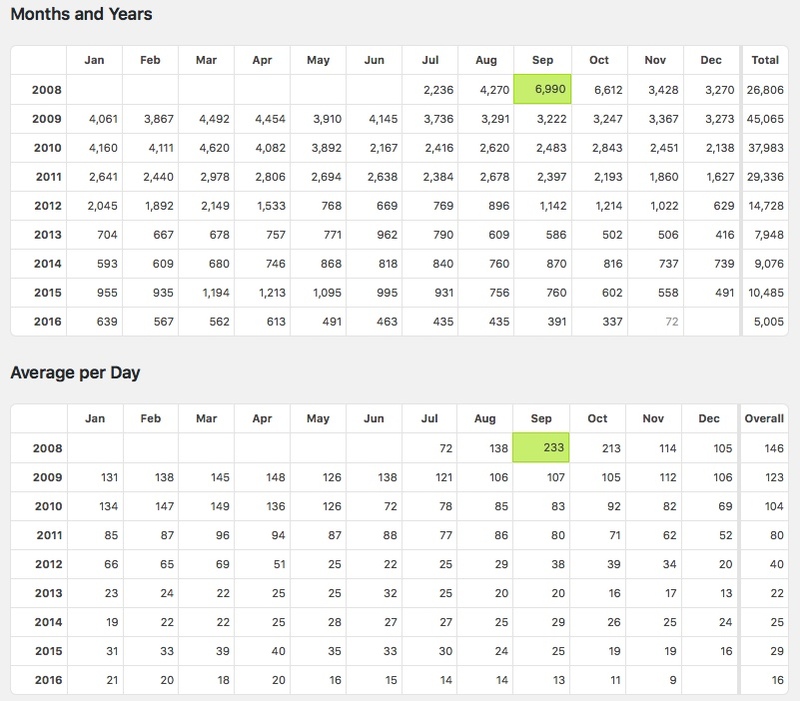 The traffic held pretty steady till May 2012. The Google Penguin update started in April 2012 and traffic dropped in half because of it. Don’t think I was doing anything wrong. Google just made changes. Traffic jumped up a little in Sept 2012 to Nov 2012 because of the 2012 Presidential Election again. My previous Barack Obama post received most of the traffic. You can see though that without new content the overall site dropped. That’s just how the internet works. These were the top 35 keywords and phrases (over 200 more) people used to find the site. 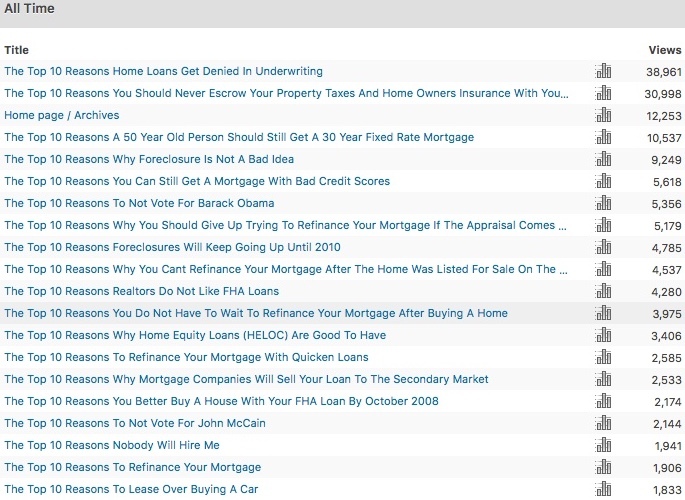 Lots of mortgage related phrases which made for nice earnings when people clicked on my Google Adsense Ads. It’s a shame they banned me for some reason which I still do not know. Would be nice to go and look at reports from the site. My premise – The Top 10 Reasons – wasn’t far off. 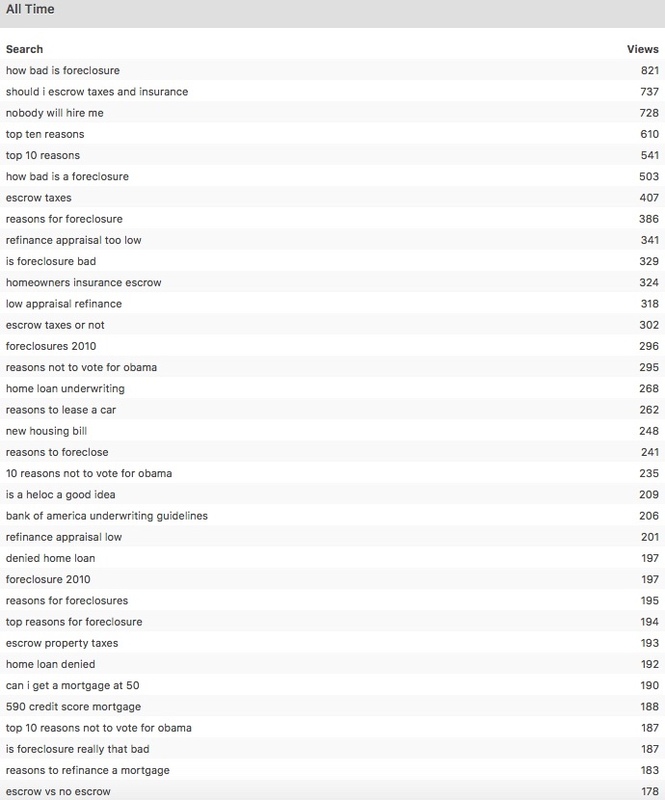 You can see my #4 and #5 keyword phrases (long tail phrases in the SEO biz) were “top ten reasons” and “top 10 reasons”. Mixed in the other phrases were use of the word “reason.” Google still allows me to have access to Adwords and within it their keyword planner tool (i.e – you can see how many searches in Google there are for a term or phrase every month. Figured I could capture the 100 to 1000 searches for the “Top 10 Reasons” every month along with the actual post. Seeing there was very little competition I thought it might have worked. It might still. Not sure if people have the patience for 10 reasons anymore though. You see whats wrong there? Without knowing it I was doing keyword stuffing by including “the top 10 reasons” twice. Short and sweet. All of the stats above would not include “The Top 10 Reasons” in them. By not including “The Top 10 Reasons” in the post title it also would have made it less redundant when you started to read the post. A little shorter. The reader would probably have figured out why there were 10 Reasons after seeing the title of the site. I have transferred all of the content here and have done a 301 redirect. Will also keep renewing the domain name at GoDaddy every year until the search engines make their changes and point the content here. If you are interested in buying TheTop10Reasons.com feel free to contact me. I might consider selling it with all of my prior content or just the domain name.